Synergy > Diffusion Audio Inc.
An old saying, "The whole is greater than the sum of its parts", expresses the basic meaning of Synergy. Amplifiers are basically a planned amalgamation of transformers, transistors, capacitors and tubes that can increase the power of a given input signal. However, the care, thought and expertise put into the choosing of the actual components, and how they are assembled affects the final tone in very unique ways. When a reasonable amount of care is taken, combined with a mass market sensibility for components, you wind up with a decent sounding amp ready for mass production. However, when painstaking attention is given to every aspect of every frequency an amp can produce, with a specific tonal ‘goal’ in mind, and only the finest components, masterfully assembled will achieve this goal, you’ve moved into the area of ‘boutique’ amplification. This method of creating amplified sound usually costs considerably more than mass produced amps, making them sometimes out of reach for the average player. Typically, when a guitar player makes the leap to a boutique amp, they are so blown away by the difference in tone they now command, that they never want to play through anything else… until they play through another brand of boutique amp… now they want that one too! But, in order to afford it, most jump ship and sell the one they had to acquire the new one. 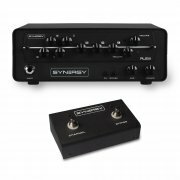 Enter Synergy Amps. After many years of contemplating that very phenomenon, and having a ‘no comprise’ attitude about tone, a unique concept was born. 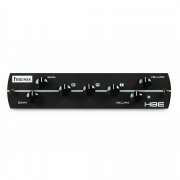 "What if we were able to get both boutique amp builders and popular mass amp builders alike to design their pre amp sections (which is responsible for the majority of the actual tone of their respective amplifiers) into a compact module, that would slide easily into a compact pre amp housing that we build, AND make it easily swappable with other modules? Also, make it so each module is 2 channels, easily hooks up to an existing amps effects loop, giving that amp 2 extra tube channels, and has a silent line out with cab sim for recording studios or to go straight into the mixing board at a show, eliminating the need for a bulky amp altogether…? Finally, make the price point so that anyone could afford it!" Well, that’s exactly what Synergy did. And the idea is taking the industry by storm! Imagine the possibilities! Synergy have taken every possible challenge scenario a guitar player might face, and built the solutions into the Synergy line. You are invited to plug in and be amazed like the rest of us!